1978 map showing geographical distribution of the major Indo-Aryan languages. (Urdu is included under Hindi. Romani, Domari, and Lomavren are outside the scope of the map.) Dotted/striped areas indicate where multilingualism is common. Some of the theories proposed in the 20th century for the dispersal of Indo-Aryan languages are described by linguist Colin Masica in the chapter, "The Historical Context and Development of Indo-Aryan" in his book, The Indo-Aryan Languages. A recent Indo-Aryan migration theory[note 2]—proposed by anthropologist David W. Anthony (in The Horse, The Wheel and Language) and by archaeologists Elena Efimovna Kuzmina and J. P. Mallory—claims that the introduction of the Indo-Aryan languages in the Indian subcontinent was a result of a migration of people from the Sintashta culture through the Bactria-Margiana Culture and into the northern Indian subcontinent (modern day India, Nepal, Bangladesh and Pakistan). These migrations started approximately 1,800 BCE, after the invention of the war chariot, and also brought Indo-Aryan languages into the Levant and possibly Inner Asia. It was part of the diffusion of Indo-European languages from the Proto-Indo-European homeland at the Pontic steppe, which started in the 5th to 4th millennia BCE, and the Indo-European migrations out of the Eurasian steppes, which started approximately 2,000 BCE. The theory posits that these Indo-Aryan speaking people may have been a genetically diverse group of people who were united by shared cultural norms and language, referred to as aryā, "noble." Diffusion of this culture and language took place by patron-client systems, which allowed for the absorption and acculturalisation of other groups into this culture, and explains the strong influence on other cultures with which it interacted. 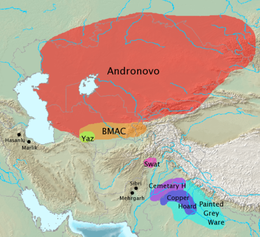 The Proto-Indo-Iranians, from which the Indo-Aryans developed, are identified with the Sintashta culture (2100–1800 BCE), and the Andronovo culture, which flourished ca. 1800–1400 BCE in the steppes around the Aral sea, present-day Kazakhstan, Uzbekistan and Turkmenistan. The proto-Indo-Iranians were influenced by the Bactria-Margiana Culture, south of the Andronovo culture, from which they borrowed their distinctive religious beliefs and practices. The Indo-Aryans split off around 1800-1600 BCE from the Iranians, whereafter the Indo-Aryans migrated into the Levant and north-western India. This scenario is disputed by the scholars who argue that Indo-Aryan culture is result of the Indus Valley culture, forming the basis for the Indo-Aryan culture that developed later. The alternate Indigenous Aryans theory places the Indo-Aryans languages as being entirely indigenous to the Indian subcontinent and later they spread outside the subcontinent; this theory is rejected by mainstream scholarship. ^ According to Reich et. al (2009), while the Indo-Aryan linguistic group occupies mainly northern parts of India, genetically, all South Asians across the Indian subcontinent are a mix of two genetically divergent ancient populations namely Ancestral North Indian (ANI) population and Ancestral South Indian (ASI) population. ‘Ancestral North Indians’ (ANI) is genetically close to Middle Easterners, Central Asians, and Europeans, whereas the other, the ‘Ancestral South Indians’ (ASI) is not close to any large modern group outside the Indian subcontinent. The mixing occurred between substructured populations instead of homogeneous populations, and at multiple times and at multiple geographic locations within a span of over thousands of years to produce the current South Asian population. Indo-Aryan speakers and traditionally upper castes have higher ANI ancestry than Dravidian speakers and traditionally middle, lower castes. ^ The term "invasion" is only being used by opponents of the Indo-Aryan Migration theory. The term "invasion" does not reflect the contemporary scholarly understanding of the Indo-Aryan migrations, and is merely being used in a polemical and distractive way. ^ "India". The World Factbook. ^ "Pakistan". The World Factbook. ^ "Bangladesh". The World Factbook. ^ "Population of Lhotshampas in Bhutan". UNHCR. 2004. Archived from the original on 16 October 2012. Retrieved 23 March 2016. ^ Masica, Colin P. (9 September 1993). "The Historical Context and Development of Indo-Aryan". The Indo-Aryan Languages. Cambridge University Press. pp. 32–60. ISBN 978-0-521-29944-2. ^ a b Witzel 2005, p. 348. ^ Anthony 2007, pp. 408–411. ^ Kuz'mina 2007, p. 222. ^ Anthony 2007, p. 390 (fig. 15.9), 405-411. ^ Anthony 2009, p. 49. ^ Olson, Carl (2016). Religious Ways of Experiencing Life: A Global and Narrative Approach. Routledge. p. 136. ^ Witzel 2001, p. 95. ^ Guha 2007, p. 341. ^ Fosse 2005, p. 438. Anthony, David W. (2007). The Horse The Wheel And Language. How Bronze-Age Riders From the Eurasian Steppes Shaped The Modern World. Princeton University Press. Bryant, Edwin (2001). The Quest for the Origins of Vedic Culture. Oxford University Press. ISBN 0-19-513777-9. Loewe, Michael; Shaughnessy, Edward L. (1999). The Cambridge History of Ancient China: From the Origins of Civilization to 221 BC. Cambridge University Press. pp. 87–88. ISBN 0-5214-7030-7. Retrieved 1 November 2013. Mallory, JP. 1998. "A European Perspective on Indo-Europeans in Asia". In The Bronze Age and Early Iron Age Peoples of Eastern and Central Asia. Ed. Mair. Washington DC: Institute for the Study of Man. Trubachov, Oleg N., 1999: Indoarica, Nauka, Moscow.